Speaking on the opening day of the Libya Investment Summit in Istanbul 9-11 May, Jason Pack, Executive Director US-Libya Business Association, said that ‘‘Libya has cultural and structural challenges inherited from the Qaddafi era. Its rentier economy dominated by the state-sector undermines the private sector. Its revenues are not being used to create strong institutions and its main institutions such as the NOC and LIA were not part of the formal institutions of power’’. ‘‘Concerns about security, back payments and LCs being honoured are shared by almost all USLBA members. Solve these and Libya could be back on its feet’’, he suggested. ‘‘After decades of under-investment, Libya needs everything’’ Debbie Hirst, Director of the American Chamber of Commerce in Libya (AmCham Libya) said in response to the question why invest in Libya. 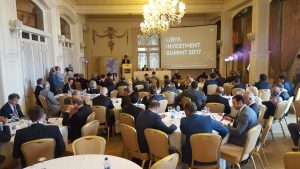 US citizen Hirst, currently still living in Libya pursuing her investments, said that Libya offered a good investment opportunity now – which would diminish once it had completely stabilised and normalized. She also refuted the perception that investors were not coming to Libya because of the security issue. ‘‘If contracts look as if they are likely to be paid, companies will manage the security situation’’, the American explained. Ghassan Barghout, President and CEO of Gas Power Systems, MENA for General Electric, which currently supplies 50 percent of operating generators in Libya said ‘‘our presence in Libya is driven by Libya’s need for power generation. We are working with GECOL on how to provide more generation for the maximum number of people in Libya’’. Barghout was optimistic about recent developments in Libya.‘‘In recent months we have seen conversion. We see things moving. Joining the conference debate on barriers to investment in Libya the GE man said that ‘‘as an investor we need a legal framework to authorize us to work. Secondly, is payment”. On the issue of the lack of security acting as a barrier to foreign companies returning to Libya Barghout said ‘‘Security is not an issue for us. We have worked in war zones and more troubled areas than Libya’’. On Libya’s very small investment budget for 2017, he said ‘‘Libya needs PPP to increase economic growth’’.